Blog Candy is now closed! Winner to be announced at the Release Party. See Side-bar for link. 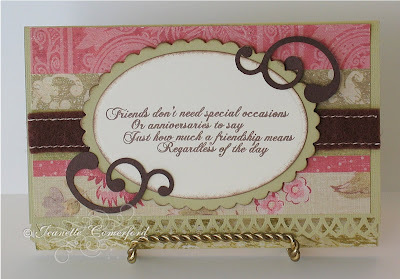 I used one of the new January releases called "A True Friend" for my card today. All the sentiments are so beautiful and are perfect for those special friends in our life. We sometimes forget to let them know how important they are! Here is the card opened up fully. I used Martha Stewart punches to do the edges on the flaps. Would you like a chance to win this set? All you have to do is make a comment on this posting! That's it! The winner will be announced at the Sweet N Sassy release party on our forum starting at 9pm EST on January 2nd! Hope you can join us! It is my first and I am hoping I don't get too lost. Good thing Korin and the other DT are so nice. I'm sure they'll guide me along! Next stop on the SNSS blog hop is Sandy's blog! Go check out her amazing creations and see what her blog candy is! I just love this set, it is something I know I would use all the time. You card is lovely! Can't wait for the release party! What a beautiful card. I love this set! Your card is stunning. I just love your colors and layout. Love how the front and you didn't stop there...no way...you even made the inside beautiful too. I just love these sentiments. Thanks for a chance. What a BEAUTIFUL card! I love all the detail and how you showed the different views of each part of the card! Love it!!!! Sweet card. Tks for the chance of winning such sweet blog candy. What a beautiful card! The blog hop has been fun to do. I would love to win this set! They are beautiful sentiments. I'd love to win a set of these stamps. Gorgeous card! Love the fold and sentiment is lovely. Your card is beautiful! And congrats on your DT spot! Oh so beautiful! Everything about it is perfect! The stamp set is lovely and you have presented it beautifully! Your card is very pretty, the verses are just wonderful. Gorgeous card! I love all the details you added. Thanks for showing this whole card like you did, it's beautiful. love the set, beautiful card! This is great!! Thanks for the inspiration & design!! ....and the opportunity to win!! Your card is very elegant! I love the punched edges. Thanks for the chance to win this great set! Gorgeous card, and the sentiments are wonderful!! The card is beautiful and the sentiments stamps are wonderful. i love your card and what an awesome set to win! Thanks for te chance! Fabulous card! I love the tri-fold and the flourishes! Awesome stamp set! Thanks for the chance to win! this is beautiful and I love all the details and you totally completed the card, inside and out. Such beautiful sayings! 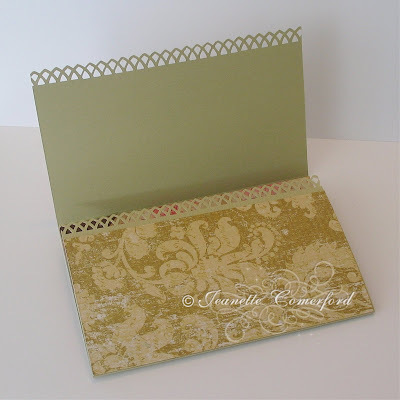 Your card is so pretty, great idea with the multiple flaps. Love the accent swirls too! 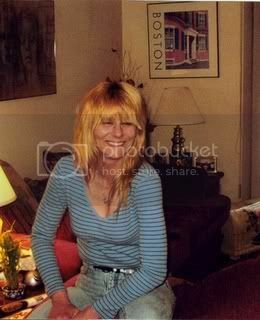 *gasp* this is just beautiful, Jeanette! This is a beautiful card and nice stamp set. Thanks for sharing. Happy New Year! Beautiful card! I love how you folded your card! What are the dimensions. Gorgeous card! Yes please may I have this set. Woooooooooooooooooooooooooow! I love love love this card! I've never seen anything like it! So beautiful! And I would love to win the set! What a lovely card! :) And I love this set. What an amazing card! I love the punched border. I'm going to have to go out and find that one now. Oh this has to be one of my favorites of the new releases! Love your first SCS card! It's gorgeous! Your card is absolutely beautiful! Thanks for sharing! I really like this card, good way to focus the stamp. I like the desinger paper you used. It is awesome and the verse is so nice. Thanks for a chance to win your blog candy. Beautiful card! Those are very nice sentiments. This is a gorgeous card. I love all the details. Yes, I would love to win this set. This is such a beautiful set of verses! I love how you embellished your card. Very pretty! wow, that is a beautiful card. Love everything about it. Super Elegant!!! I am hopping all over the place again to hopefully win some candy. Wow, that card is beautiful. Happy New Year and thanks for the chance! What a beautiful card! Those sentiments are perfect as well! Thanks for the chance to win! How pretty! This is a great set too. Wonderful sentiments. Thanks for the chance to own it. =) Happy New Year! Beautiful card! I Just love the stamp set! What a beautiful card. It is so elegant!! Love the colors! Thanks for sharing and thanks for the chance to win! These new stamps are great. Can't wait to see all things done with them. This is absolutely stunning Jeanette! Fabulously done! You did a beautiful job!!! I love the colors and everything used on the card!!! Very elegant and beautiful!!! Thanks for sharing some ideas. What a beautiful card. 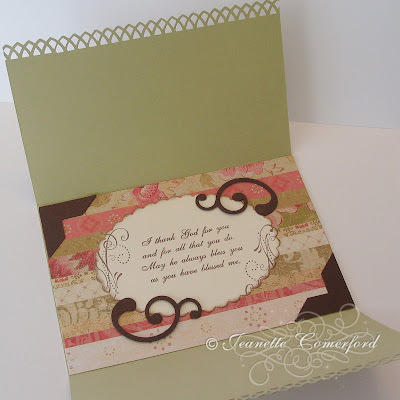 Love the stamps, the paper choice, the edge punch you used ... love it all! My first time to your blog, but for sure I'll be visiting often. oh... lovely card!!! it's wonderful!! Great idea the party tonight!! Verry pretty card!! I like the decorative edge to it and how it opens up to another sentiment! I love your card...beautiful embellishments! Can't wait for the release party. I love you card-so pretty and the beautiful embellishments! Can't wait for the release party! This new set is beautiful. You stamped it perfect! Congrats on your first DT Post! wooohooo!! Beautiful card. Thanks for the detailed photos. This card is for very lovely I love the colors and all the punch details you used. Thank you for the chance to win and have a great weekend. Beauuuuuuuuutiful! I love your card and this stamp set! I was just asked to make a b-day card for my mom for a close friend of hers. This stamp set would have been great for that card. I definitely think that I will have to get this set. Wow- this card is absolutely stunning! Thanks for the candy offer too- fingers crossed here. Gorgeous card. I love the edge on the project. Your card is so pretty. I love all the different fonts on this set!!! Ohh, love those stamps . Have enjoyed your blog... what a lovely card ! These sentiments would be great to have! Congrats on your first SNSS design team card -- it's gorgeous! I love the tri-fold layout, and all the little details. What a beautiful card. Love the detail on the edges as well! Amazing card! Good luck tonight, I'll be trying it again, (my third attempt at a release party),lol. This card is incredible. The amount of detail. Great set with beautiful words. Beautiful card. Love your card! Looking forward to the party! Very create card! Love the set you used. Love your punched border edges on the card and the sentiment is wonderful. I can't believe you just started stamping this year, no way!! Your card is so beautiful with all the little details. I love the swirls and the punched edges. Gorgeous! Very pretty card and I like the sentiment stamp set. I would get a lot of use out of it. Wonderful card. Looking forward to the party tonight. I love the card. And such a neat stamp set. What a beautiful card! Love it! TFS! Great card, you will surely be an asset to the DT. I may have to scrap lift this card. Happy New Year and Good Luck . Great card--I love these sentiments!! I have so enjoyed the blog hop and am excited to hook up with you all tonight--hopfully I will be a winner!! This set is awesome! I'm always in need of an everyday saying and those look like just the ticket. Great design for the card too--I'm excited to try something like that. Thanks! What a gorgeous card! I'm glad to see other people using the "old" in colors too! I love this set, and your card is so beautiful. Thanks for the chance to win. 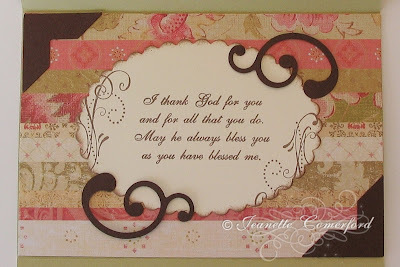 What a beautiful card...'love these sentiments! Thanks for the chance to win! BEAUTIFUL Card!! Love this set!! Gorgeous card! I love all of the new stamp sets, and the cards you gals are making. This card is absolutely beautiful!